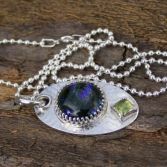 Beautiful handcrafted glass cabochon with deep blues and green sparkle set into a large sterling silver oval pendant. 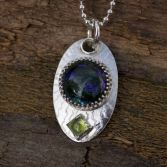 I have also set a pretty green square Peridot gemstone. The pendant is a one of a kind (only one made) around the settings is a line detail which catches light beautifully. 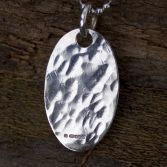 The sterling silver pendant is made from 1.2mm thick sheet silver and has full uk Hallmark stamped on the reverse of the Oval. There's a solid silver bail loop which is quite thick and has been soldered together. 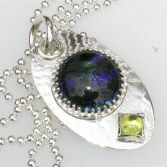 The pendant is then hung a 2.2mm thick solid ball sterling silver chain which is 18 inches in length. 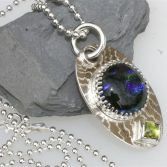 The pendant measures length 40mm including loop by 22mm wide and approximately 9mm depth. 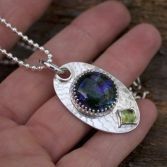 Your Large Dichroic & Peridot necklace will be presented in one of my signature gift boxes and posted via Royal Mail special delivery (signed for) to any address in the UK free of charge.